You probably have some type of LED (light-emitting diode) in just about every room in your home, whether it’s in a clock, computer display, appliance or piece audio/video gear, to name a few. And the proliferation isn’t over. Within the last few years, LEDs have been touted as a replacement for regular household incandescent bulbs. To date you’ve seen LEDs in under-cabinet strip lighting, flood lights and small bulbs, but the 60-watt replacement—the workhorse bulb for most homes—has remained elusive. This year, though, it looks like the dimmable 60-watt replacement LED bulb will finally give the incandescent some competition. LED bulbs last about 40 times longer (about 19 years based on 3 hours use per day), require less than one tenth of the electricity and, unlike red-hot incandescent bulbs, they give off so little heat they can be used in sealed environments. However there are a few drawbacks. They cost about $50, so while over the long run they’ll cost less, you have to lay out your cash up front. They only come in a frosted glass, and they require a heat sync (metal fins at the base of the bulb). While the bulb feels cool to the touch, the components inside generate less light as they heat up. When shopping for an LED bulb, you’ll want to pay attention to the light output, which is measured in lumens (Current Federal Trade Commission regulations require most bulb packages to display it). For a true replacement, you need about 850 lumens, the amount a 60-watt incandescent puts out. Most bulbs touted to be 60-watt replacements fall short. You’ll see 6- to 8-watt LED bulbs labeled as such. LED lumen output varies, however when you consider that most LED bulbs output less than 100 lumens per watt, you can see why the lumen rating is so important. The other factor to consider is the color of the light. The warmer the white, the more it will look like a traditional incandescent and the more flattering it will be to most skin tones (look for one between 2700-3000 degrees Kelvin). Cooler lights provide higher contrast, which make them better for reading. Today, color labeling varies by manufacturer and by the type of bulb. However the Federal Trade Commission is working on a new label that may be finalized later this year that will add color appearance, the estimated yearly cost of operation and mercury content. 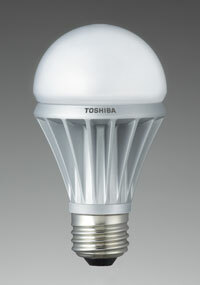 Today there are a few non-dimmable bulbs on the market, including the 7.5-watt GEObulb-2 ($45 at ccrane.com) and 6-watt Pharox60 ($50 at mypharox.com), both of which produce light output closer to a 40-watt bulb, if you look at the lumens. Last fall Panasonic was showing a 6.9-watt bulb at CEATEC, the Japanese electronics show, and this spring Toshiba says it will start selling a 6.9-watt bulb here in the U.S. The ball is rolling. 5mm LED’s should almost never be used for general illumination. That is the capsule type that most people think of when they imagine LED’s. The problem is that most 5mm LED’s are barely more efficient than incandescent bulbs. Also there is another measure of the quality of light called CRI or color rendering index, look up the details but again 5mm LED’s are normally rubbish at this. So if you see a product based on a cluster of 5mm LED’s it’s probably worth avoiding. I would hate poor quality products to turn people off what is a fantastic technology. Is the fact that a bulb uses a 5mm LED something you can easily find out? You can tell by looking as they will use clusters of at least 20 LED’s. More LED’s is defiantly not better. Quality products will normally have only 3 highly efficient LED’s. Great blog about bulbs. You help people to understand the details of what I need to know if I want to make the change. Thanks! This is really great news, since selling LED’s I decided to invest in LED replacements for my house and it’s really made a different to electricity bills - not just saying that, it’s a worthwhile investment! Isn’t it about time? Why on earth do manufacturers still produce wattage hungry bulbs and why would shops still sell them? Yes please, keep the ball rolling, for as long as possible, because so much energy is saved using LED bulbs. These bulbs are expensive but they are getting cheaper every year. With fuel prices shooting up I think it won’t be long until these bulbs are the standard, even taking over from CFLs.